There are many approaches to teaching the general public about mental health and about taking away the stigma that haunts the field of mental illness. In the last year, Monadnock Family Services has taken one national initiative and made it more practical. Thanks to the courageous and pioneering work of NH Former Chief Justice John Broderick and others, “The Campaign to Change Direction” came to the Granite State in 2016. Broderick, himself no stranger to the impact of mental illness on a family, wanted to make the signs of mental health distress as well known to the public as the signs of heart attack or stroke. Throughout 2017, he crisscrossed the State speaking to any group who wanted to hear his riveting message, raising money for billboards, media messages and print material, all so that a normal conversation about mental health could be a regular part of living. 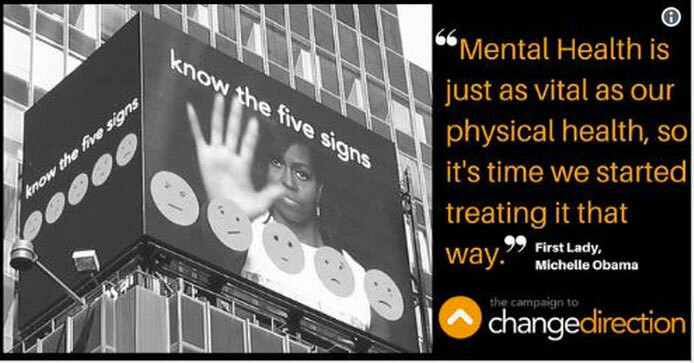 The campaign to change direction is a coalition of concerned citizens and leaders from both the private and not-for-profit sector who have come together, at the instigation of child psychologist Barbara Van Dahlen PhD and considered by Time magazine in 2012 as one of the 100 most influential people in the country, to change the culture in America about mental health. The campaign is backed by the Substance Abuse and Mental Health Services Administration and many corporate partners. Even Former First Lady Michele Obama is pitching in with public service announcements. Paramount in the campaign is the message that there are five signs of emotional suffering that are common to many manifestations of mental health problems that surface, often long before the sufferer realizes something risky is happening. By Broderick’s own admission, helping the public understand what they can do to assist the person experiencing these difficult emotions is less well developed. This is where the new training MFS provides adds to the Change Direction initiative. When people know five steps of how they can help, they might change the direction for the sufferer away from illness and towards health. Hold off on making judgements. Ask questions. Try to find a time and a place that makes the person feel safe and at-ease. Ask the individual to explain further. Use body language that shows concern. Listen for what the person needs. Think as you are listening. How urgent is the situation being described? Is there a risk of suicide, self-harm or violence? Give messages to the individual to clarify what you are hearing. Validate that the person’s suffering or problems are important. Show empathy and concern. Emphasize reasons for HOPE. Strive to be sincere and credible. Have and share knowledge about mental health resources. Describe professional help services. Share ideas for self help strategies. If possible, involve the individual in next steps: should they get help now, or use self-help now and later? Is ‘watchful waiting’ possible? Assist with action if appropriate. Plan to follow up and/or monitor. Contact us to schedule a workshop for your company or group.